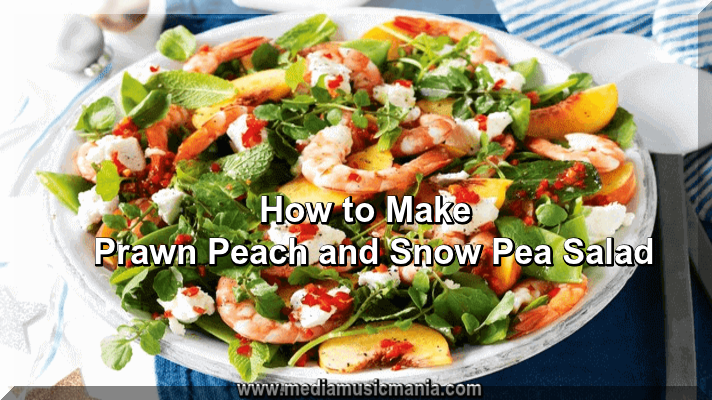 By this useful tutorial I guide you how to make make fresh Prawn, Peach and Snow Pea Salad. The Salad is simple, prepared with simple things which I mention in this Article.Looking for a delicious salad make Prawn Peach and Snow Pea Salad with. Use a sharp knife to cut the snow peas in half diagonally. To make the lime and chili dressing, combine the lime juice, oil, vinegar, garlic, chili and sugar in a screw-top jar and shake until well combined. Toss the watercress, peach, mint leaves, prawns and snow peas in a bowl Salad. Trim the snow peas and cut them in half diagonally. Place in a heatproof bowl, cover the boiling water and leave for 1-2 minutes, or until just softened. Drain and refresh under cold running water, then drain again and place n a large salad bowl. Peel, halve and dice the peaches. Add to the snow peas, along with the prawns. Whisk the lime juice with the olive oil and salt and black pepper to taste. Pour over the salad and gently mix to combine. Arrange the lettuce leaves on a serving platter. Neatly pile the prawn salad over the top and serve. Alternatively, roughly tear the cos lettuce and add to the salad before serving. For extra bite, add a finely chopped red chili.